The basic botanical category of plant classification is the species, hence all plants (many hybrids excepted) have a species name; namely a species binomial. The basic category of horticultural classification is the cultivar. Hence for gardeners, typically, the full name of a plant is the species binomial followed by the cultivar epithet. Naming plants in horticulture is governed by the International Code of Nomenclature for Cultivated Plants (the ICNCP), the Cultivated Plant Code (CPC) for short. The Cultivated Plant Code recognises only three categories of classification, the cultivar, the Group and the grex. "Cultivar" is the fundamental category and the name of a cultivar is basic to its precise identification. The term itself is derived from the words "cultivated" and "variety". Variety, in this context, is used as a general term and does not refer to the botanical category of the same name. In the Cultivated Plant Code a cultivar is described as a plant which has been selected for one or a combination of characters. To be recognized as a cultivar, the cultivar should be distinct and all examples of it be uniform. In addition, the character(s) of the cultivar should be (genetically) stable over time, whether the cultivar is raised from seed or p ropagated vegetally. In reality, this is not always so. For instance, Phlox paniculata 'Peppermint Twist' (see right), itself discovered as a branch mutations of P. paniculata 'Candy Floss', may produce branch mutations apparently reverting back to it's parent plant. Among Echinacea, cultivars of the Big Sky series, produced by hybridizing two different species of Echinacea, may develop deformed flowers. As indicated, cultivars may be produced in various ways. They can simply be "discovered" in the wild, in gardens, commercial greenhouses or the like. More often they are produced deliberately, traditionally using hybridization or grafting, also by inducing polyploidy or gene mutations and most recently by genetic engineering. Cultivars are chosen for various useful and/or attractive attributes. For perennial gardens, a clump forming mode of plant growth is highly desirable. Prolific runners and seeders act invasively in a perennial bed. Thus from this perspective, New England aster cultivars, can be viewed as "tamed" versions of their wild relatives. In terms of attractiveness, traditional aims of garden plant selection include selecting cultivars for things like flower colour and form, fragrance and variegation of leaves. The trend to smaller gardens has resulted in selection for compact forms. Shorter forms of perennials have been selected to avoid the need for staking. In the area of disease resistance, selection for mildew-resistance has been particularly evident for perennials like phlox and lungbanes. Since July 2011, the name of the International Code of Botanical Nomenclature has been changed to the International Code of Nomenclature (for algae, fungi and plants (ICN)). The Cultivated Plant Code is shorter and simpler than the ICN, but it too provides standardized rules for naming plants. The basic approach of the ICN to naming is continued in the CPC; for instance, the naming of a new cultivar is based on priority of publication. Accordingly, the first valid name published is the correct one. On the other hand, the publication requirements are more relaxed; the name of a new cultivar can be published in a catalogue or a seed list, rather than in a book or journal. International Cultivar Registration Authorities (ICRAs), organisations that operate under the ICNCP, are responsible for recording the correct names of cultivars. Registering cultivars with the appropriate ICRA ensures the preservation of their names. The name of a cultivar must include two parts. (1) the botanical name of the plant (typically a species binomial) and (2) a "cultivar epithet" which follows. The latter is analagous to the species epithet of a species binomial. A cultivar epithet consists of up to three words in a modern language. Since 1959, a Latin or Latinized word can not be used, unless it is in everyday usage. A cultivar epithet is enclosed in single quotation marks and is not italicized. The first letter of each word is capitalized (except for a conjunction or preposition, unless either is the first word). The CPC does permit abbreviating cultivar names, if no amibiguity results. 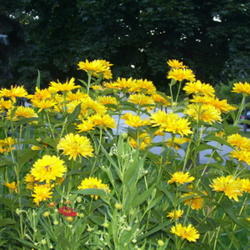 The species epithet can be omitted and only the genus name and cultivar epithet be us ed; for instance Heliopsis 'Summer Sun' for Heliopsis helianthoides 'Summer Sun' (see left). In addition, again if no ambiguity results, only the common name of the genus and the cultivar epithet can be used; for example, false sunflower 'Summer Sun'. In the case of hybrids, the name of a cultivar may be in forms like Heucherella 'Plum Pudding', Primula 'Wanda' and Leucathemum x superbum 'Aglaia'. The CPC does not normally allow the same cultivar epithet to be duplicated within the same "denomination class", latter usually being a genus or Group. Since 1996, cultivar epithets should not be translated. The correct cultivar epithet is the one published when the cultivar was named. Hence Veronicastrum virginicum 'Lavendelturm' (see right, below) can not be represented as Veronicastrum virginicum 'Lavender Tower'. A translation of the name of a cultivar, however, can be included on a plant label or in a plant list as a "trade designation", using a different type. The latter is what the CPC calls a commercial name. 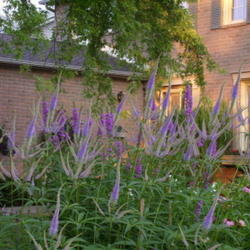 An example is Veronicastrum virginicum LAVENDER TOWER (= 'Lavendelturm'). In terms of nomenclature, the translation of a name could be viewed as a synonym (viz. not the valid name). Trade designations (selling names included) are a commercial matter and not dealt with by the CPC. The CPC deals with botanical and horticultural nomenclature, its purpose being the precise (international) identification of plants. For those who grow plants commercially, or who sell them, marketing and/or legal protection may be of key concern. Neverthless, for their customers (gardeners) to be able to tell exactly what they are buying, whatever else, the selling labels/lists must include the cultivar epithet. This seems obvious, since commercial concerns may result in different trade designation (includes translations) being applied to the same cultivar and also different cultivars being assigned the same trade designation. Trade designations should not be in single quotes because they are not cultivar epithets. On the other hand, cultivar epithets may be used as trade designations. The CPC recognizes two additions categories beyond cultivar, Group (first letter capitalized) and grex (first letter not capitalized). Grex is a refinement of Group and is used only with orchids. A Group is a collection of cultivars which share certain defined characters. Since all the members of a Group do not have to be named cultivars, the old term "cultivar Group" is obsolete. Group is used when numbers of cultivars have been produced from a single cultivar and also when a known cultivar becomes variable. On occasions, a plant may lose it's species name due to botanical reclassified and become just a member of another species. In this situation, the obsolete name of a well known garden plant can be retained by using it as the name of a Group (e.g. Rhododendron polycladum (Scintillans Group)). A Group epithet must contain the word "Group", which may be translated into other languages. When used with the name of a cultivar, the Group epithet must be placed within parentheses, never between single quotes. Consequently, for the hybrid columbines of the McKana Group the following are correct: Aquilegia McKana Group and Aquilegia 'McKana Improved Giants' (McKana Group). The variable fall monkshood, A. carmichaelii 'Arendsii', may be regarded as A. carmichaelii Arendsii Group or A. carmichaelii 'Arendsii' (Arendsii Group). The collective of "series" is now increasingly being used. This is a marketing device which is not contained in the CPC. It is frequently used with seed strains for different colour forms of the same plant. Among perennials, Astra Series, Fuji Series and Hakone Series all contain different coloured balloon flowers. Salvia nemorosa 'Blue' (Sensation Series) is one of the seven colours of this perennial salvia. Other information, on plant lists or labels, which could lead to confusion in identification, includes patent numbers and trade marks. A patent number indicates (intellectual) ownership of a cultivar. Such a plant can only be asexually propagated, used or sold, by (or with the authority of) the patent holder(s). 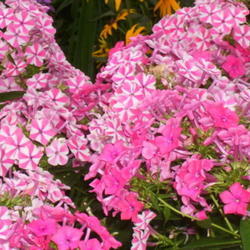 That goes for the whole plant or any part of it, e.g.Phlox paniculata 'Peppermint Twist' PP#18,196. A plant patent lasts for 20 years from the time it was applied for. PPAF, on a plant list or label, gives notice that a plant patent has been applied for. Those who purchase plants should be able to know exactly what they are purchasing. This clearly requires accurate plant identification. A growing trend, which threatens this, is the current horticultural use of trademarked names to identify plants. Nonsensical cultivar epithets, including numbers, may have been assigned and this has the effect of forcing purchasers into accepting cultivar identification by means of trademarked names. The whole intent of CPC naming is that names be assigned according to clearly stated rules, that the names which are established be internationally recognised and that nobody can have ownership over those names. Trademark names are used by both growers and retailers to promote sales. In addition, trade marked names (trademarks last ten years) are renewable indefinitely. This trend clearly threatens the right of purchasers to know exactly which plant they are dealing with. To some, it may seem excessive to be concerned about the name (accurate identification) of plants purchased or grown. My own feeling is otherwise. Learning and using accurate plant names is part of effective gardening, which includes, not least, being able to communicate with other serious gardeners. In addition, learning and using correct plant names is a way in which gardeners themselves grow.